RETIRE IN STYLE BLOG: What Did I Do to Deserve This...in a good way! What Did I Do to Deserve This...in a good way! I write about retirement, travel, books and family with some blogging advice and thoughts about current events thrown in. I have never followed the big piece of advice given by all the experts. "Stick to one subject they say." I DO NOT STICK TO ONE SUBJECT! It seems to be working. It is a good day for me...really, in spite of the title of this blog post. I have been recognized by a website promoting retirement in Costa Rica. 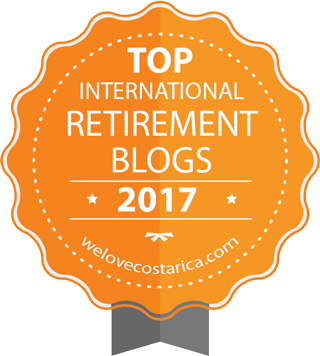 The award was for being one of the Top International Retirement Blogs in 2017. I thought that it was not who chose the list though. I was impressed at the company I am keeping in retirement blogging these days. That is good. And the really good part is, I am not nearly done yet. I don't even know if I ever will be. One day I suppose I will be finished writing. When I am, I may let you know and I may not. I may not even know I have stopped myself ! The door will remain open. As I look back, I am surprised at how I have traveled as far as I have in this world. Malcolm Gladwell wrote about the Beatles in one of his books. The story was that the Beatles put in 10,000 hours of work before they even became THE BEATLES. Getting to know any craft is very hard. It is not so much about talent as it is about hard work. I am not even near that point yet. Back in the day when blogging for seniors was unheard of, I began talking about retirement. The first blog was called Always At Home. We were just starting our traveling journey and it seemed that no matter where I was in the world, I felt at home. I don't need much. That was back in 2006. I changed the blog title several times before I settled on the current name and domain. The only way I could find to connect with people was through memes posted by other bloggers like myself. We would write a story or a poem and then comment on each other's material. Actually, I did meet some very unique and talented writers through that process. I would slip those in on a Friday or a Sunday. The rest of the time I just wrote about my life. I needed an audience though. I began looking for older people and found grandmothers. That was one way of connecting. But I found that no men were writing. As men like Bob Lowry (Satisfying Retirement), Tom Sightings (US News and World Report) and RJ Walters (RJSCorner.net) came on the scene the picture became more complete. I was glad to have someone that was not a grandmother or a mommy blogger to connect with. I wore out every subject I talked about and all that was left was LIFE! So, life is what I have been writing about ever since. 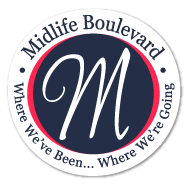 A wonderful new closed Facebook woman's group opened a few years ago and I was one of the first to join Women of Midlife (even though that ship had sailed for me). That group now boasts 2000 women. Even that group sees an ebb and flow. Still the core group remains very stable. I have found people that share my woman's journey. Now I write about retirement, travel, books and family with some blogging advice and thoughts about current events thrown in. I have never followed the big piece of advice given by all the experts...Stick to one subject. I DO NOT STICK TO ONE SUBJECT! Back in the day when I was teaching school I had a student tell me that he wanted to be a doctor so why did he need to read all those books and learn about the world at large. My reply was that if he only learned about being a doctor, he was going to be very boring! I think that may be why I do what I do. I invite you to go over to look at the list of Top International Retirement Blogs. How did your journey as blogger begin? I am interested. Love reading about your start. My start came because I wanted to share the journals (Mom's, Dad's, Grandmas', Grandpas', Uncles, Aunts, etc.) that I'd collected from my very prolific family members. It's been a joyful journey! I actually wanted to share my travels with my grade school granddaughter. The school would not let her show them (10 years ago). They were afraid! Really! Congrats on the award! :) I started blogging when a writer friend kept bugging me about it. lol Glad she did. I've made some wonderful connections through my blog. How long have you been blogging Lisa? 2004--my friend (much younger) asked if I wanted to start blogs. I said "what's a blog/" (Not really). Anyway I was very lucky as people found me and my blog took off. Now most of my better posts are in drafts as they're long and where once I was fearless now I feel too hunkered down by "rules." I've never been a rules girl, obviously! I can see that Pia! You have been at this for a very long time. I like that a lot. I began posting my thrift shop finds (and still do), then I segued into modeling thrifted fashion (stopped doing that on the blog 2 years ago) and moved into quilting/sewing. I also post an annual Countdown to Christmas and will start preparing for those posts next month. I love this platform and all aspects of blogging. You are very good at what you do Tami. I think that we need to change as our interests change. The idea that we will have ONE idea and write about that forever is just not going to work. I had wanted to write and wanted to share some of my photos. I was thinking of blogging, and thinking, and thinking, for several years. On April 3, 2009, there was a mass shooting in walking distance of where I work (14 dead, including the shooter) and it got me off the fence. I started my blog later that month. My very first post was the email I sent to people I know telling them I was OK. I've kept on because I enjoy blogging and interacting with other bloggers but I do not recommend how I started out! I cannot even imagine how that might be. I suppose blogging can be therapy of sorts and if it is still working like it is for me, don't quit. Thank you for stopping by. I started my blog four years ago, about six months before I retired. I also thought I'd be writing about one thing (settling into retirement and the challenges I might face), but I soon learned that - for me anyway - retirement was the best gig ever and was pretty easy to get used to. 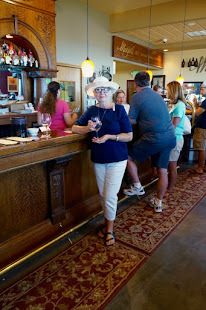 Now I write about traveling, connections, gratitude, and just about anything that catches my interest... including retirement. I'm not a grandmother nor do we have any kids. The connections I've made with other bloggers keeps me writing. That is what keeps me going too. I find people are interesting. Reading and even participating in their journey keeps me happy. Congratulations on your sell-deserved recognition ... and you know we all love your wide-ranging posts that are reliably informative and entertaining! Thank you Tom...I don't know about the reliable part but I am out here doing what I do. I suppose when you choose to visit that is reward enough.